Computer-controlled, high-speed, bartacking machine. Wider sewing area and many different sewing patterns. Electronic thread tension control mechanism. 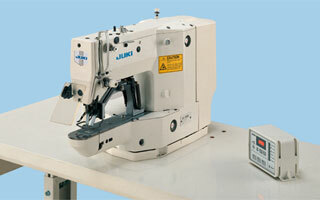 ♦ Sewing area - 30mm(L) x 40mm(W) . ♦ F - for foundation, H - for heavy-weight materials, M - for knits and knitted materials, S - standard, W - with a large shuttle hook for heavy-weight materials.